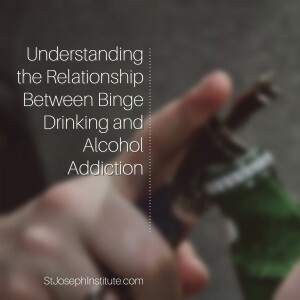 The relationship between binge drinking and alcoholism is often misunderstood. The majority of binge drinkers are not physically dependent on alcohol, but binge drinking is considered a significant risk factor for developing an alcohol use disorder. Binge drinking refers to consuming large quantities of alcohol in a short period of time. There is some disagreement as to what constitutes binge drinking, but many addiction professionals use the guidelines established by the Substance Abuse and Mental Health Services Administration (SAMHSA). For men, binge drinking is defined as consuming five or more drinks on the same occasion at least once in the last 30 days. Since women process alcohol differently due to their smaller size and different biological makeup, binge drinking for women is defined as drinking four or more drinks at least once in the last 30 days. According to the National Institute on Alcohol Abuse and Alcoholism (NIAAA), this level of alcohol consumption in a 2-hour span of time is enough to place an average sized person’s blood alcohol content (BAC) at .08. This is the level at which drunk driving penalties apply if you get behind the wheel. Motivations for binge drinking vary. Binge drinking is most common in social settings, with many people viewing alcohol consumption as a way to have fun and temporarily forget their problems. Teens and young adults may view binge drinking as a way to test their tolerance and rebel against authority. According to the Centers for Disease Control (CDC), binge drinking is very common. About 1 in 6 adults in the United States engages in binge drinking 4 or more times per month, consuming an average of 8 drinks in each binge. Binge drinking behavior strongly varies by age and gender. Men are twice as likely to binge drink as women. People ages 18 to 34 are more likely to engage in binge drinking than older adults. Surprisingly, binge drinking is more common among upper income adults. People with household incomes of $75,000 or more likely to engage in binge drinking than lower income individuals. However, lower income individuals consume more drinks on average when they do engage in binge drinking. Binge drinking does not necessarily mean that a person suffers from an alcohol use disorder, although many people who enter treatment for alcoholism have a history of binge drinking. Feeling as though drinking is the only way to cope with stress, sadness, anger, anxiety, or other uncomfortable emotions. The relationship between binge drinking and addiction is strongest in adolescents, with teens who report frequent binge drinking having nearly triple the risk of developing an alcohol use disorder as adults. If you believe that your binge drinking may be a sign of an alcohol problem, help is available. Alcoholism is a treatable disease, but you can’t beat it alone. Treatment for an alcohol use disorder typically includes individual and group therapy to focus on learning coping strategies for handling cravings and managing emotions without drinking. Experiential therapies such as equine therapy, art therapy, or music therapy can also be used to encourage people who have trouble talking about their feelings to process the issues that are contributing to their substance abuse. It is common for people who suffer from an alcohol use disorder to also meet the criteria for mental disorders such as anxiety, depression, or PTSD. When someone has a dual disease or co-occurring disorder, treating both conditions simultaneously is vital to providing a solid foundation for a sustained recovery.